What they had discovered was the aluminum calipers were so old and porous they were leaking brake fluid around the seals on the pucks. This was causing the spongey pedal after just a few laps. There was nothing that we could do for this race, but Jim was already planning how to permanently fix the problem. His idea was to sleeve the calipers. Certainly a winter project. For this weekend they would plan on bleeding the brakes for every session. I would be sensitive to any softness in the pedal and just take it easy. 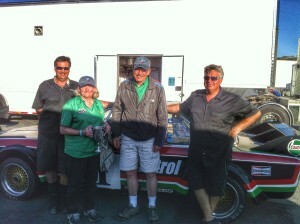 One of the highlights of Saturday for Mary and I is having our whole family come out and cheer the car and Grandpa on. We usually get some team shirts and hats made up for everybody. It’s a lot of fun. Here’s everybody in their Team Luigi regalia. That tall interloper in the back is Adam Carolla. The time came for the qualifying race and I lined up 23rd out of 44 cars. Unfortunately I got stuck behind a turbo Porsche that was quick down the straights, but slower than my CSL through the corners. It was pretty frustrating not to be able to get by him. I ended up finishing 19th. I got an excellent start in the feature race, which was good because I desperatly wanted to get by the Porsche early in the race. Once by, I found myself racing with Ernie Spada in his IROC 911, and Dennis Singleton in his green RSR Porsche. We ran nose-to-tail for several laps. It was a lot of fun. I sneaked by Ernie as he was balked by a slowing Ferrari coming out of Turn 5. About this time Adam Carolla came up from behind in his ex-Paul Newman 300 ZX Datsun. He got by me just as we turned up the hill towards the Cork Screw. As we got to the top of the hill the red flag came out so we all pulled over to a stop. Her I am leading Ernie Spada and Dennis Singleton. Adam Carolla is lurking at the back. This was the lap before the red flag. Unfortunately Ken Epsman in his Dekon Monza had a wheel break going through Turn 4. He went off into the tire barrier in a big cloud of dust, and his left rear tire bounced over the fence and into the grandstand. Fortunately no one was struck, but all emergency vehicles were dispatched to the scene. After collecting the field with the pace car we had one last lap under green. I had a mirror full of yellow and green Porsches, but I was able to hold them both off to finish 6th. It was a great race, and a lot of fun. 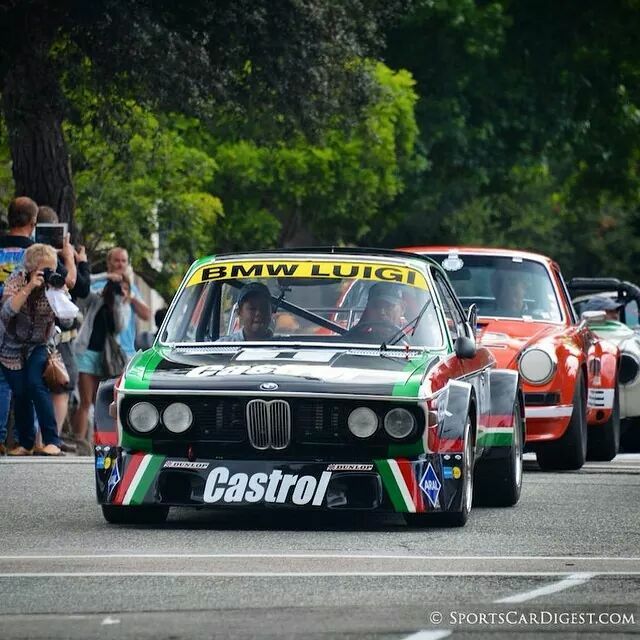 Thanks to Jim and Terry and their great work on Luigi. At the Awards Ceremony we were given the Rolex Award of Excellence for Group 5A. 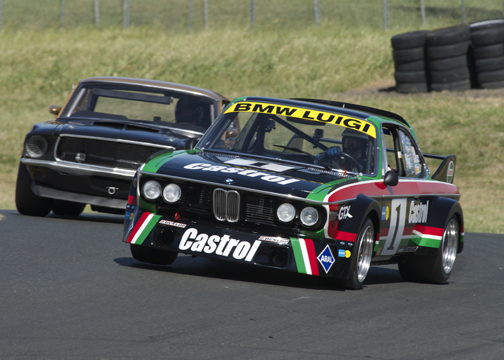 Certainly this was due to the beautiful restoration work done by Racecraft. Thank you Terry and Jim! Adam Carolla does a video podcast called Carcast. 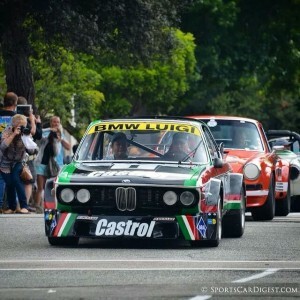 He featured his outings in his Datsun, and there are some shots of the Luigi CSL. NOTE: These are rated PG-13 for language. Every year during the 2nd and 3rd weekends of August there occurs an event that boggles the automotive mind. 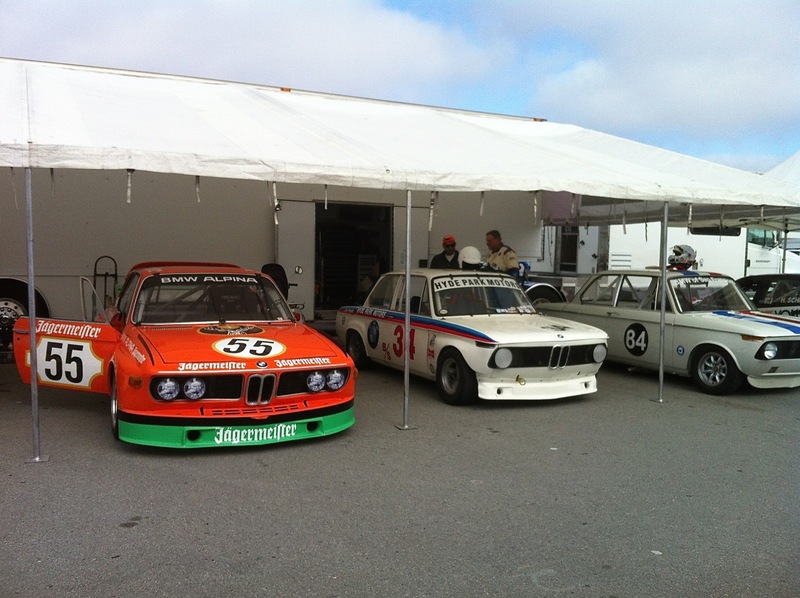 It is called “Car Week,” and it happens on the Monterey Peninsula. 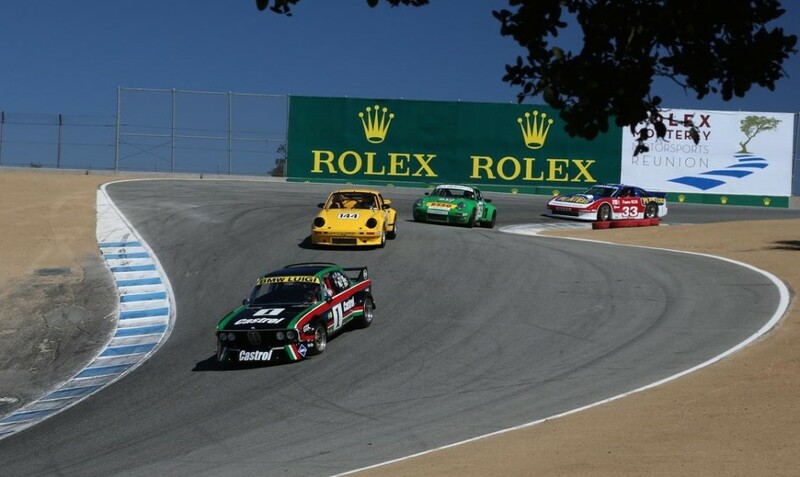 During the week there are 5 major auctions, 7 major car shows or concours, a dozen minor events, and the Rolex races at Laguna Seca. People come from around the world to attend the event. 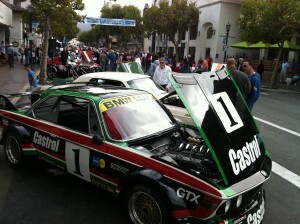 Luigi on display in downtown Monterey on the Friday evening before the Pre-reunion races. This year I signed up for a couple of new events for us, including the Friday evening car show in downtown Monterey. About 25-30 race cars are escorted by CHiPS from the track into downtown Monterey and put on display for anyone and everyone. One of the local restaurants provides hors d’oeuvres for the participants. 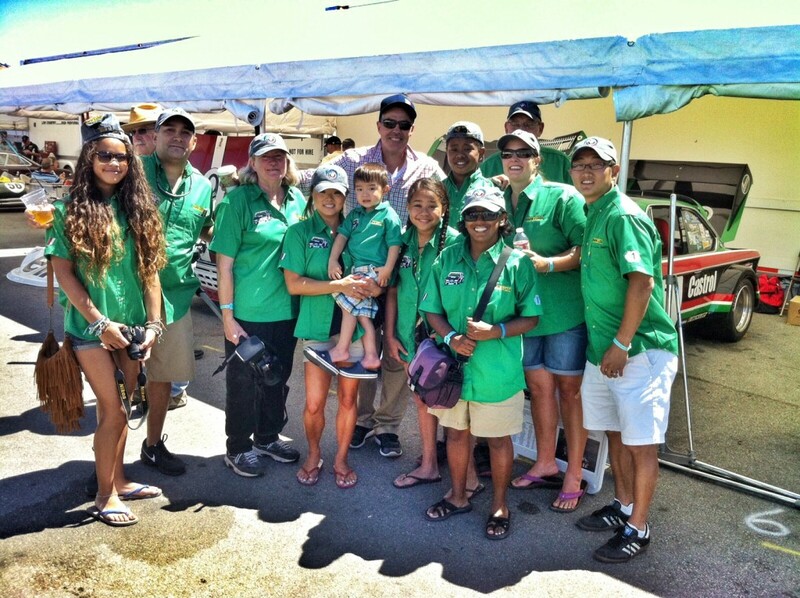 It is a very fun event that really kicks off the entire car week scene. On the way back to the track the lead motorcycle officer cracked the throttle, and of course, we had to keep up with him. He had a big smile on his face when we arrived back at the track. Fun duty! We raced the Pre-reunion race on Sunday. It was a bit of a disappointment because we only got 2 sessions on track for the whole weekend- qualifying and then the race. We were still fighting some brake issues, but I managed to finish mid-pack. The group we ran in is was quite a mixed bag with a GTP Toyota, some big-block IMSA cars, and some tube frame Trans Am cars, along with the usual mix of turbo and non-turbo Porsches. On Tuesday we again were part of an escorted group from the track. 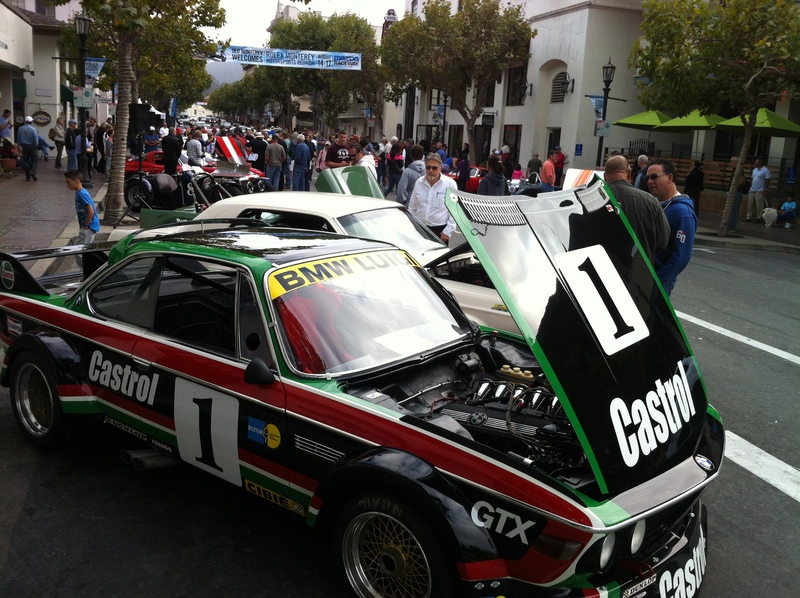 This time we traveled to downtown Carmel for the Concours on the Avenue. My grandson, Andrew, rode with me in the car. It was a lot of fun to come down from Highway 1 through Carmel to Ocean Avenue with crowds of people snapping pictures and cheering us on. Andrew and I are part of the parade of race cars through Carmel to Ocean Avenue. 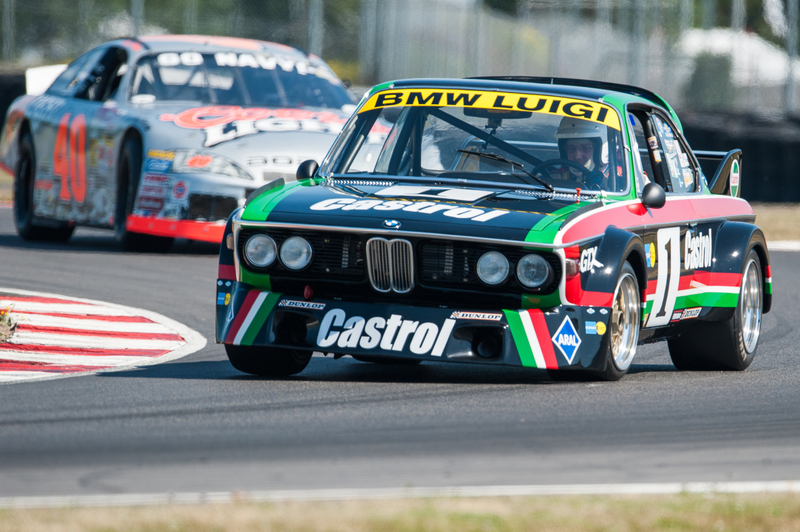 Luigi was awarded “Best in Class” among the race cars. Quite an honor and tribute to Racecraft’s work! 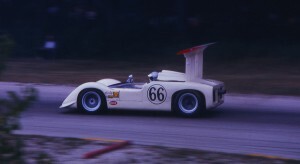 There were 2 other CSLs in the group, Henry Schmitt’s IMSA car, and the factory museum car. There was also the factory museum M1 driven by Randy Probst, along with Porsches, Datsun Z-cars, big block IMSA cars, an IROC Camaro, and Adam Carolla in is turbo 300ZX. Quite a collection of fast cars! On Thursday I had the brake pedal go to the floor as I broke for turn 5. 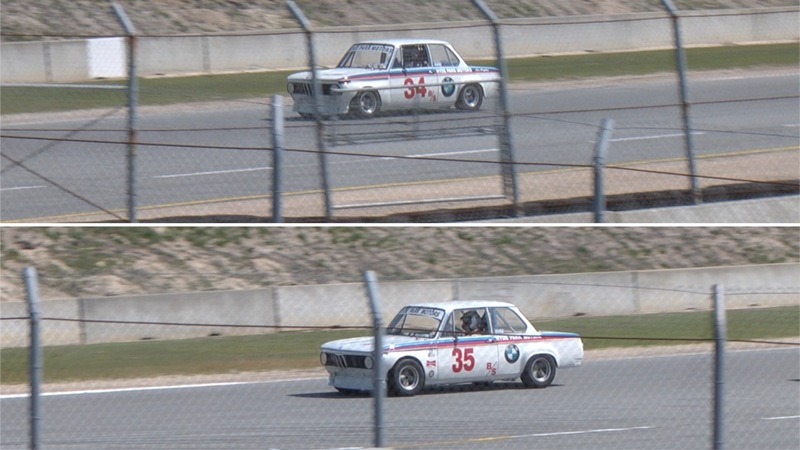 I was right outside of a 935 Porsche, and had to pump the pedal furiously to get the car slowed enough to make the corner. It turned out to be a new brake “problem.” It seems we threw a wheel weight, which struck the retaining clip for the brake pads, allowing them to move back out of position. How strange is that? Friday’s practice went much better. I put in a couple of good laps and qualified 23rd out of 44 cars. I still didn’t have complete confidence in the brakes, and was breaking pretty early for turns 2, 5, and 11. After 5-6 laps the pedal was still getting spongy. Something was still not 100% with the brakes. Saturday Mary and I arrived at the track early to find Terry, Jim, and Mike huddled over Luigi’s left rear brake caliper on the table in front of the Racecraft truck. It didn’t look good. Here I am sitting on pre-grid in the Koepchen 2002 waiting to go out for qualifying. 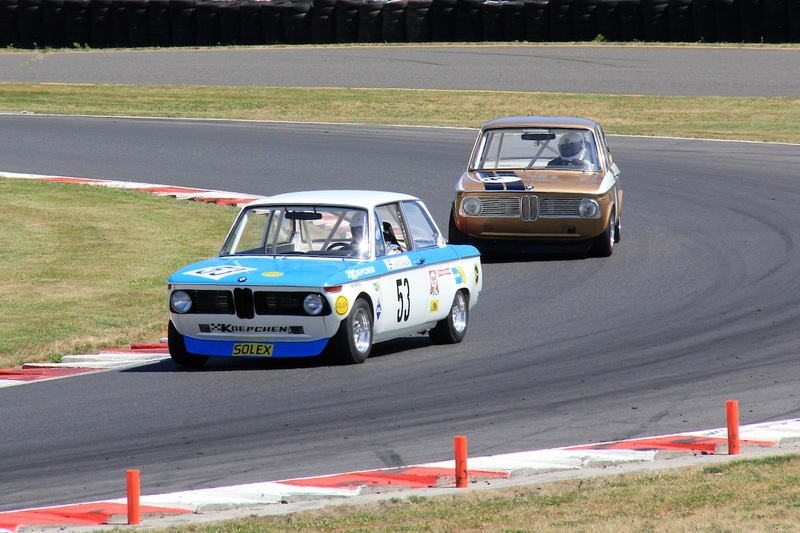 I had three cars entered for the 2014 Portland Historics, held July 11-13 at Portland International Raceway- the freshly re-done 700, the Koepchen 2002, and the Luigi CSL. Right from the very first lap of practice on Friday the trouble began. 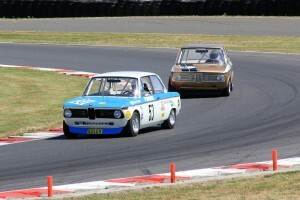 Here I am being chased by John Murray in his 2002. Usually he is in front. practice the left side barrel separated from the block. Not knowing the cause, or if any internal damage was done, we decided it was best to park the car for the rest of the weekend. Next up was the 2002. This car is pretty quick, however, the Group it was running in was made up of ‘B’ sedans from the 60’s and early 70’s, and since Datsun was the featured marque this year there was a whole bunch of very fast Datsun 510’s up from California in my group. I was able to qualify well, about mid-pack, and ran both races on Saturday without incident. Sunday morning I went out for the warm-up session, and the motor did not feel right. Jim started to check the engine and found it had no oil pressure. At first we thought that the drive gear had come off the oil pump shaft, but it turned out to be much more serious than that. The motor went down to Terry Tinney and he found that the chain tensioner for the cam drive chain had broken and dropped down into the front of the timing chain cover. There it lodged in the chain and broke the crankshaft. So we had 2 major engine failures. But wait there’s more. Luigi working hard to stay ahead of some American Iron. That left me racing the CSL. 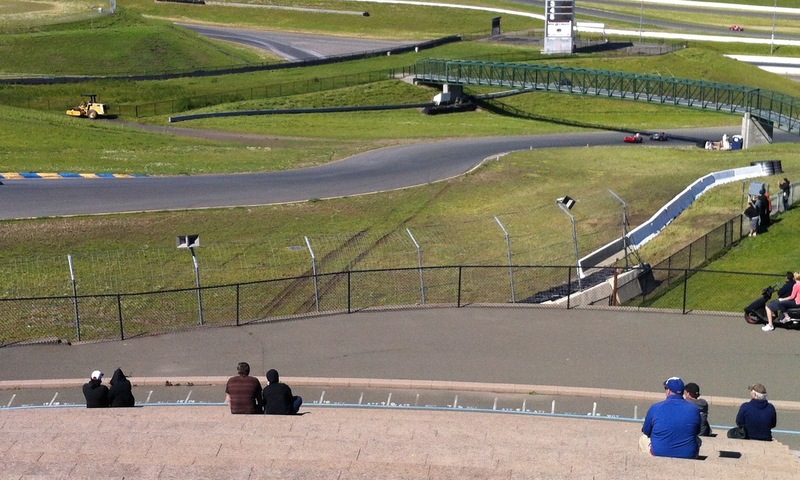 You may remember that we had brake issues in Sonoma that almost caused me to wreck the car. Those issues reared their ugly head this weekend as well with similar results. Jim had changed the brake fluid to a higher temp fluid. But the problem showed up again during my first qualifying race. Going into the chicane on the opening lap I almost wrecked it again when the front brakes didn’t work. Jim put on some heat shielding for the next race, but still the pedal went mushy after a few laps. 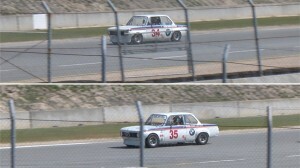 The cherry on top of the sunday came on Sunday when a thunderstorm came through just before the flag race for the CSL. Since I don’t have rain tires for the car I was forced to sit it out. Not a very fun weekend to say the least. The twins ready for battle. 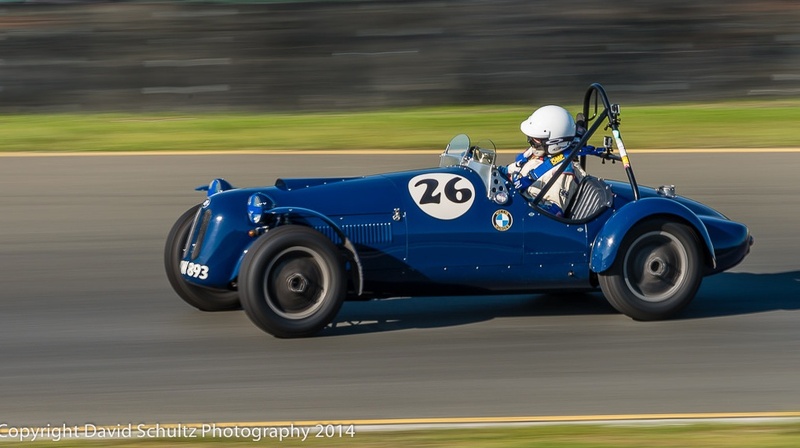 I entered the twins for the PNW Historics at Pacific Raceway in Kent, WA. 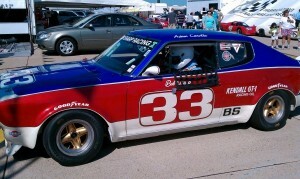 They ran in Group 4, and I drove the #34, while Terry Foreland drove the #35. The weekend was a lot of fun. There was a great turn out of cars and a great crowd. SOVREN put on a great event! The last time I drove the car I had trouble fitting my legs under the steering shaft so that I could operate the pedals cleanly. Jim moved the shaft up quite a bit, so now I fit the car much better. My lap times improved each session, which was gratifying. The car handles quite well, and the brakes work. The biggest problem I had was that I was running out of gear about half way down the straight. I had to feather the throttle from start-finish all the way down to the brake zone for Turn 2. For Race 4 I started to just lift off the throttle fully when I hit 8,000 RPM. This was happening just at the turn in for Turn 1. I would then mash the throttle again and by the time I was back up to 8,000 it was time to brake for Turn 2. 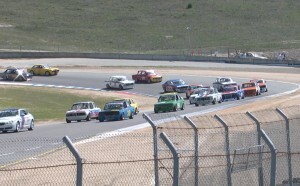 #34 leading a bunch of Group 4 cars. That’s Pat Costin following me in his 911. I think all the feathering I did in the first 3 races may have contributed to the head gasket starting to leak in Race 4. We decided to park the car following that race before anything expensive happened. Here’s the link to 3 videos I did about the weekend. The first is a promo for SOVREN. The second is the in-car footage from my car. 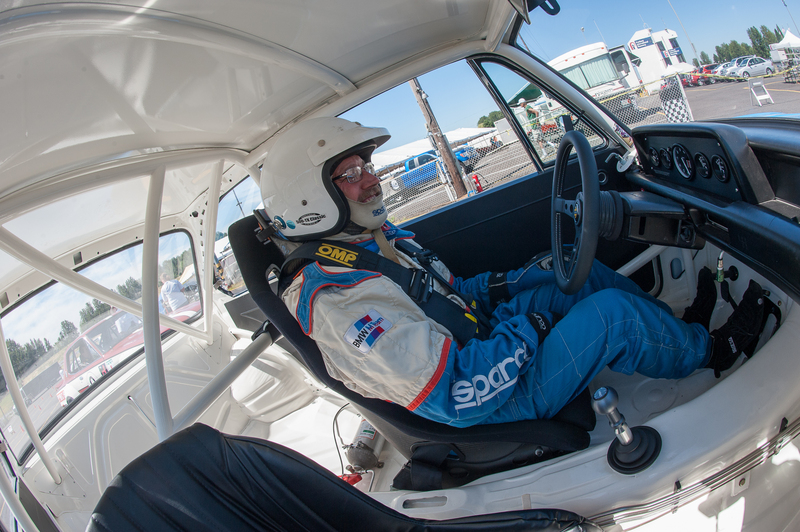 The third is in-car footage from Terry Forland’s drive in the #35 car in the USRRC Seniors Tour race. Do I need to tell you who this is? 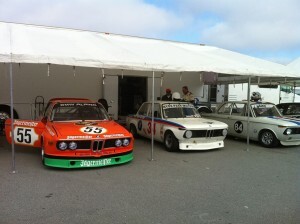 I saw these cars race at Road America many times. As a young man I spent many summers hanging out at Road America watching some of the biggest names of the day racing some of the most spectacular cars of the period. 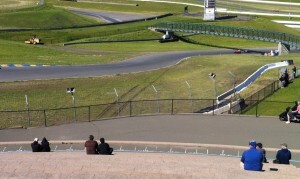 It left an indelible mark in my memory, and a craving to be on that track in a race car some day. But it would be decades before that dream became a reality. I never got to race on that track while I lived in the mid-west. The last race I attended there was a combination F-5000, Trans-Am weekend in the early 1970’s. A few years later I got married, moved west and thought I’d never get the chance to drive Road America at speed. However, last summer Mary and I made the trip back to our old stomping grounds, and I finally got to race on the track I had always dreamed about. Its a long drive from Amity, Oregon to Elkhart Lake, Wisconsin. We left in our RV on Sunday morning, July 14, and planned to arrive Wednesday afternoon, July 17. 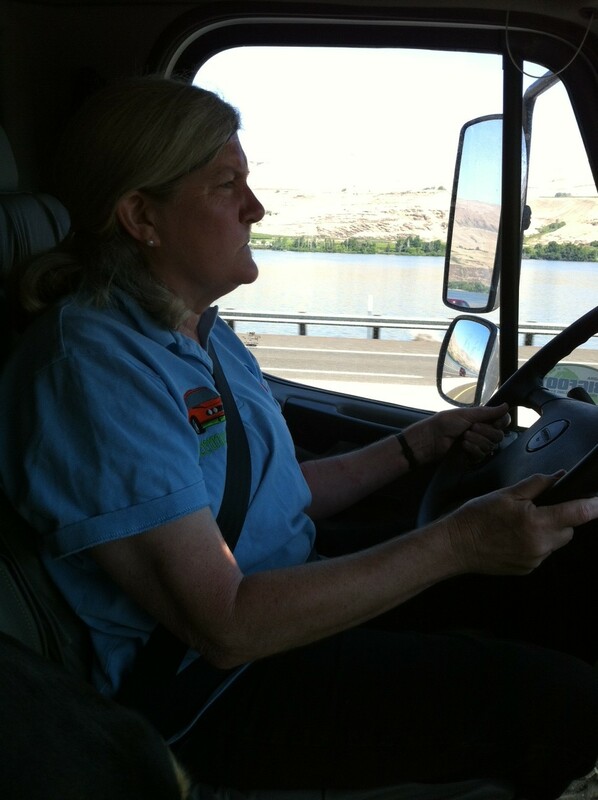 Mary takes a turn herding the RV down the highway. We headed east out of Portland and up the Columbia Gorge on I-84, turning north at Tri-cities. We made our way up 395 to Spokane, and then headed east on I-90 through the Idaho Panhandle into western Montana. Then the long slog the length of Montana, North Dakota, and down through western Minnesota into the Twin Cities. We spent Tuesday evening at some old friends house west of Minneapolis, and left early Wednesday morning for Elkhart Lake, arriving about 2:30 that afternoon. The Koepchen 2002 had been hauled to Road America via Mont Tremblant by Racecraft, so we just needed to find their rig in the paddock. Not as easy as it sounds. The paddock at Road America is huge, and it was full of participants and their rigs. After checking in and getting our credentials we found a paddock steward to help us locate our crew and car. I qualified in the top 10, which is a testament to the great job Terry Tinney did on the motor. 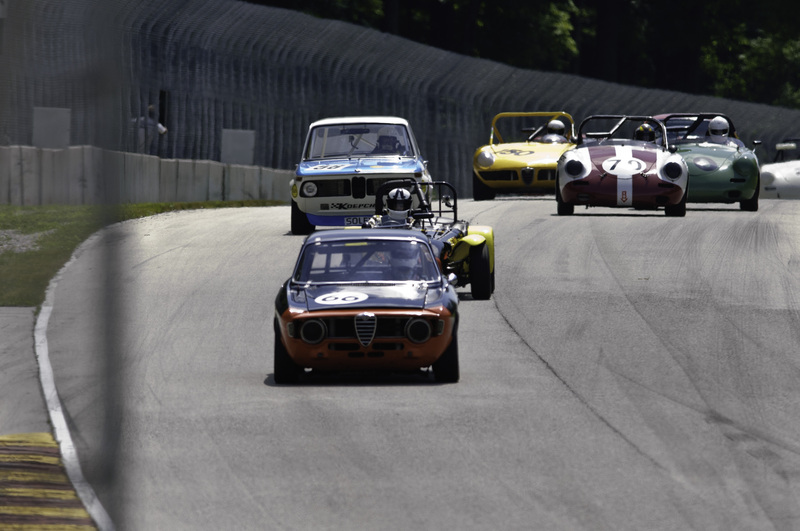 Road America is a horsepower track, and we were getting 125 mph down the three straights. Not to shabby for a box! My Group was the first race on Sunday. I was lined up 5th behind Vic Skirmants in his quick 356 Porsche. At the drop of the flag I was able to get by him down the back straight. I was also passed by an Elva, but he made a mistake at the Kink and damaged his car. Vic and I traded positions for the entire race. I was quicker down the straights. He was better under brakes, and through a couple of turns. On the last lap we caught some lapped traffic, and I got held up through the kink. Vic got just enough of a gap that I couldn’t catch him on the front straight. It was a lot of fun! After a great weekend we loaded the RV and began the long trek back west. 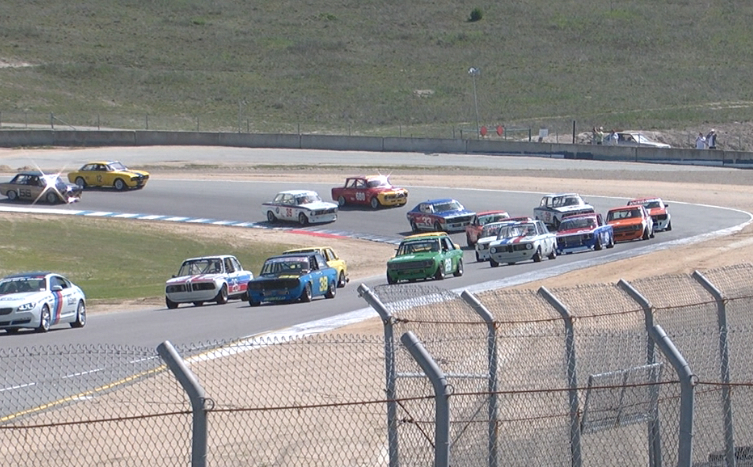 Here I am in the lead pack of Group 2 braking for turn 5 with Vic Skirmants on the inside. The track was everything I hoped for, plus a lot more. As you watch the videos, look at the park-like atmosphere they have created. No wonder it is such a racer and fan favorite.